volved in V(D)J recombination and double-stranded break repair in mammalian systems (reviewed in refs. 107 and 108). In yeast, the absence of Ku results in a variety of telomere-related effects, including the alteration of telomeric clustering (discussed above) (109), critical telomeric shortening (110,111), disrupted telom-eric silencing potentially through alterations of the telomeric chromatin (112-114), and elongation of the single-stranded overhang from 20 nt to 50-90 nt (115,116). The association of Ku with mammalian telomeres raises an interesting problem: specifically, how does the cell prevent telomere-associated Ku from functioning in a double-strand break repair pathway? In addition to the proteins that directly bind telomeric DNA, other proteins have been identified that associate with the telomere by binding the former factors, for example TRF1 (see Fig. 4A) or TRF2 (see Fig. 4B). 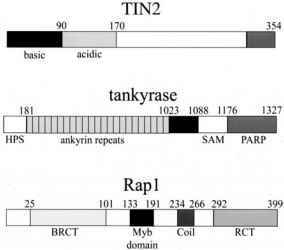 To date, seven proteins have been shown to associate with telomeric DNA in this manner: TIN2 (also known as TINF2); tankyrase; Rap1; the Mre11 complex of proteins including Mre11, Rad50, and NBS1; and the Ku heterodimer. A human TRF1-interacting nuclear protein, TIN2/TINF2, has been identified from a yeast two-hybrid screen as a unique TRF1-associated protein with no homology to known proteins (117) (Fig. 5A). The amino-terminus of TIN2 contains two adjacent basic domains followed by an acidic domain. These three regions may form a-helices. TIN2 and TRF1 interact via an ~80-amino acid domain within the carboxy-terminal half of TIN2 and a portion of the homodimerization domain of TRF1 (see Fig. 4A). This interaction is stable both in vivo and in vitro. TIN2 colocalizes with the telomeres as well as with TRF1 in vivo throughout the cell cycle and is expressed in a wide variety of tissue types. The colocalization of the proteins with the chromosome ends suggests that the DNA-binding activity of TRF1 is not affected by its interaction with TIN2. Since this interaction involves the dimerization domain of TRF1, it remains possible that the way in which TRF1 binds DNA at distant sites or its ability to synapse two telomeric tracts is altered by TIN2/TINF2 association. Figure 5 Schematic diagram of the structures of hTin2, tankyrase, and hRapl. (1327-amino acid) protein, has homology to both ankyrins and poly-ADP ribose polymerase (PARP). Ankyrins are structural proteins involved in associating the cytoskeleton to integral membrane proteins via a repeated 33-amino acid motif (ankyrin repeat) (119). Twenty-four tandem ankyrin repeats are centrally located within tankyrase, but no other homology exists between tankyrase and other ankyrins. TRF1 and tankyrase associate via the amino-terminal acidic domain of TRF1 and the ankyrin repeats of tankyrase (see Fig. 4A). Owing to the involvement of the acidic domain of TRF1 in this association, TRF2 is not expected to form a complex with tankyrase. Consistent with this, yeast two-hybrid screens have failed to detect a TRF2/tankyrase interaction (120). In addition to the homology with ankyrins, tankyrase contains a carboxy-ter-minal domain with homology to the catalytic domain of PARP (118). PARP catalyzes the addition of chains of ADP-ribose onto protein targets in response to DNA damage using nicotinamide adenine dinucleotide (NAD+) as a substrate (reviewed in Refs. 121 and 122). The degree of homology is low (~30% identity), but all of the amino acids required to bind the NAD+ substrate and to catalyze the addition of ADP-ribose polymers are conserved. Tankyrase is capable of self-ribosylation, as well as ribosylation of TRF1, but does not modify TRF2 (118). The modification of TRF1 results in an inhibition of TRF1 binding to telomeric DNA in vitro. Tankyrase localization and expression differ from that of TRF1. The protein is expressed consistently throughout the cell cycle in a wide variety of cell lines (118,123). A portion of the cellular tankyrase always colocalizes with TRF1 and therefore with telomeres (123). The remaining tankyrase associates with the nuclear pores and centromeres in a cell cycle-dependent manner. Throughout interphase, tankyrase resides at the nuclear pores and at the cytoplasmic side of the nuclear envelope at the Golgi apparatus (123,124). When cells enter mitosis, tankyrase relocates to the centrosomes (123). Nuclear pore localization may reflect a structural function or may simply provide an available pool of tankyrase. Centrosomal localization raises the interesting possibility of involvement of tankyrase in meiotic telomere-induced bouquet formation. This possibility is strengthened by the finding of high levels of tankyrase expression in rat testis and therefore in meiotic prophase I (S. Smith, P. Morris, T. deLange, unpublished results). hRap1 (see Fig. 5C) interacts with telomeric DNA through TRF2 (125). hRap1 is an ortholog of yRap1, the most abundant double-stranded telomere-binding protein in yeast (126-129). The orthologs share three domains in common: a 95-amino acid BRCT domain at the amino-terminus (130,131), a centrally located Myb domain (132), and a Rap1-specific protein-protein interacting domain at the carboxy-terminus. The main difference lies in the central Myb domains: whereas hRap1 has only one, yRap1 has two adjacent domains, which bind DNA directly. Although hRap1 appears to be capable of forming dimers through interactions between the carboxyl-terminal regions of the monomers, hRap1 does not bind telomeric DNA directly (125). hRap1 interacts with TRF2 through its car-boxy-terminal domain (see Fig. 4B) (amino acids 123-366) (125), and hence would not be expected to interact with TRF1, which contains a very different C-terminal sequence. The stoichiometry of the two proteins bound to DNA has not been established. Examination of the intracellular localization of hRap1 reveals a punctate pattern that corresponds to the chromosome ends throughout the cell cycle in all cell types examined (125). Since DNA-associated TRF2 is required to observe this pattern, hRap1 is not thought to disrupt TRF2 binding to the TTAGGG repeat tract. The Mre11 complex is composed of three components, Mre11, Rad50, and NBS1, and plays a central role in the processing of double-stranded breaks (reviewed in Refs. 133 and 134). In vitro, Mre11 functions as a single-stranded (ss) and double-stranded (ds) nuclease with 3'-5' directionality that can also cleave hairpin structures (135-139). Rad50 binds ds DNA, and, through hydrolysis of ATP, functions as a helicase to unwind DNA (140-143). NBS1 increases the nuclease activity of Mre11 and the helicase activity of Rad50 (142). The yeast Mre11 com plex is composed of Mre11, Rad50, XRS2 and is similar to the human Mre11 complex. The yeast complex is essential for telomeric maintenance, with a mutation in any of the components resulting in telomeric shortening (112,113,144). 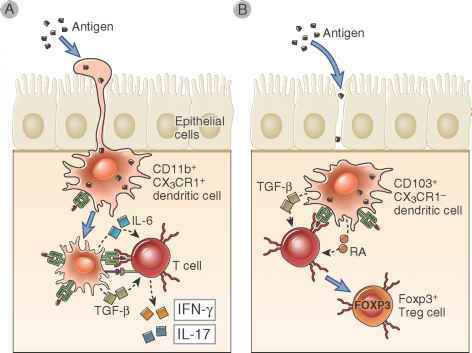 A number of proteins, including TRF1 and TRF2, interact with the Mre11 complex, with interactions between the Mre11 complex and TRF2 being detected by nanoelectrospray polypeptide sequencing and coimmunoprecipitation (see Fig. 4B) (145). Based on the coimmunoprecipitation data, only a small fraction of the cellular Mre11 is associated with TRF2. Similarly, only a small fraction of TRF2 interacts with the Mre11 complex. This is reflected in the observation that only a small amount of the total cellular Mre11 and Rad50 colocalize with TRF1, and therefore the telomeres in vivo. Neither Mre11 nor Rad50 bind TRF1 directly (146). NBS1 localizes to the telomere in a cell cycle-specific manner (145). During interphase, NBS1 is localized to the nucleoli, and only during DNA replication is it seen at the telomere. In meiotic chromosomes, NBS1 colocalizes with Mre11 and the telomere (147). The telomeric localization of NBS1 appears to be due to its association with TRF1 (146). This association is promoted by interaction between the carboxy-terminus domain of NBS1 and full-length TRF1 (see Fig. 4A). When associated with NBS1, TRF1 is still capable of binding telomeric DNA. Although the purpose of this complex is unclear, association with NBS1 does not eliminate the TTAGGG-binding properties of TRF1. Several roles have been suggested for the Mre11 complex in telomeric maintenance. One popular idea is that the complex is required to generate the 3' TTAGGG overhang at one or both chromosome ends. The finding that Mre11 is associated with TRF2, which is required for end protection (discussed below), lends some support to this possibility. The Mre11 complex might also play a role in regulating cellular life span (the "aging clock") by facilitating the regulated loss of telomeric repeats. Ku associates with mammalian telomeres indirectly through interactions with both TRF proteins (148,149). Surface plasmon resonance has revealed a stable, high-affinity interaction between TRF1 and the Ku heterodimer (149). TRF1 and Ku can be coimmunoprecipitated from cell lysates, supporting the presence of TRF1/Ku complexes in vivo. The interaction with Ku does not alter the DNA-binding activity of TRF1, since the proteins colocalize to telomeres of human cells (100,149). This indirect association of Ku with the telomere suggests a function for Ku distinct from its role in nonhomologous end joining, although the specific function is unclear. Both Ku and TRF1 have been shown to associate with the nuclear matrix, and thus Ku may function to anchor and localize the telomere to the matrix. A yeast two-hybrid screen has been used to demonstrate that Ku70 associates specifically with TRF2 (148) via the central region of Ku70, including a Leu-Ser repeat and the central region of TRF2, including a large portion of the dimer-ization domain (amino acids 38-240) (see Fig. 4A). The Ku70-interacting domain of TRF2 overlaps substantially with the Rap1-interacting domain, raising the question of their competition for TRF2 association. The TRF2-interacting domain of Ku70 does not overlap with the known Ku80-associating region (150-152). The three proteins, Ku70, Ku80, and TRF2, are capable of forming a trimeric complex in vitro (148). It appears, therefore, that Ku80 and TRF2 do not compete for Ku70 binding. In vivo, however, the trimeric complex has not been isolated. Rather Ku70/Ku80 and Ku70/TRF2 complexes are observed. It may be that TRF2/Ku70 is no longer capable of associating with Ku80 once the complex is bound to the DNA, or that an additional factor may exist that binds to Ku70, thereby preventing Ku80 association. It has been shown that the level of matrix-associated Ku70 is higher than that of Ku80 (153), and therefore a trimeric complex may not be common owing to the low availability of Ku80 at the telomere.